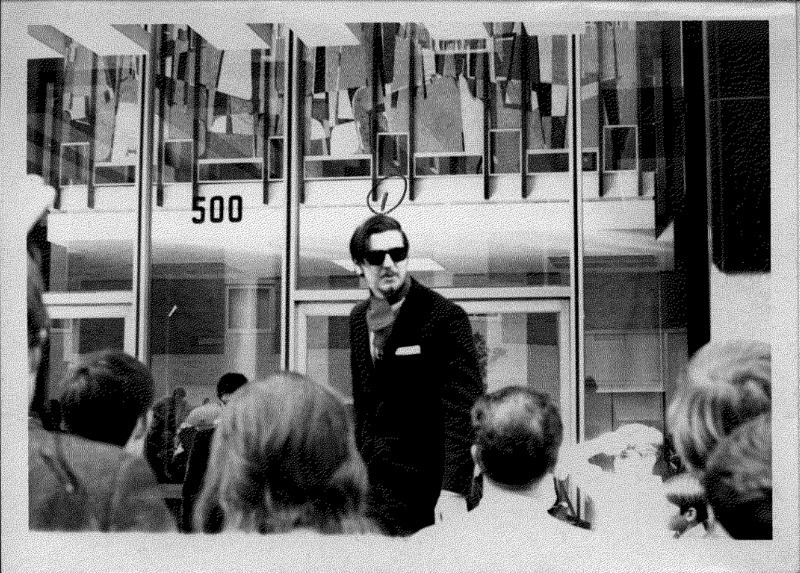 The Bay Area Coalition was a student-lead organization gathered around protesting the Vietnam War. 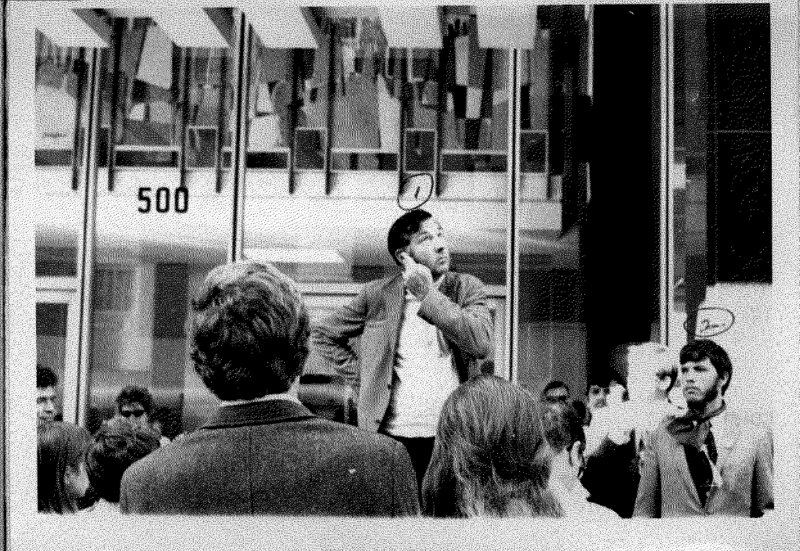 Centered on the USF Tampa Campus, the Coalition was investigated by the FBI while they planned a protest for downtown Tampa in December of 1968. Files obtained through a freedom of information act allows for an understanding of how worried authorities were of dissent during this decade of social change. November 25th, 1968. The Federal Bureau of Investigation receives a teletype message labeled URGENT from Agent O’Flaherty in Tampa, Florida. The message informs of an upcoming demonstration being planned by an organization known as “Bay Area Coalition” for December 7th, Pearl Harbor Day. The response from O’Flahertys’ director returns: collect any and all information on this Bay Area Coalition, its’ members, purpose, and intent of this demonstration. They put together a team of investigators that included five special agents and began accessing all information available about the individuals involved in this protest. 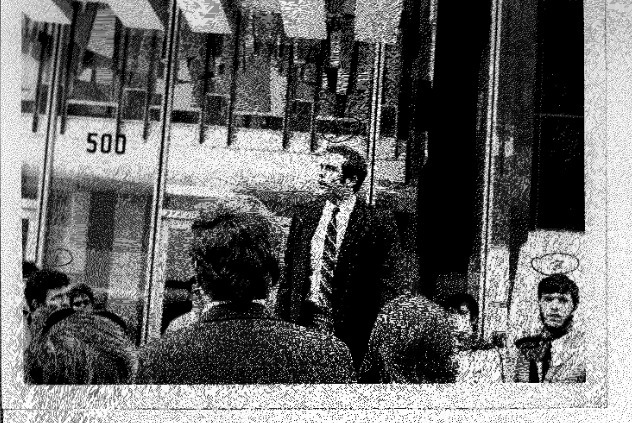 Chip Jeffries was a student at the University of South Florida, and leader of the demonstration with the Bay Area Coalition. 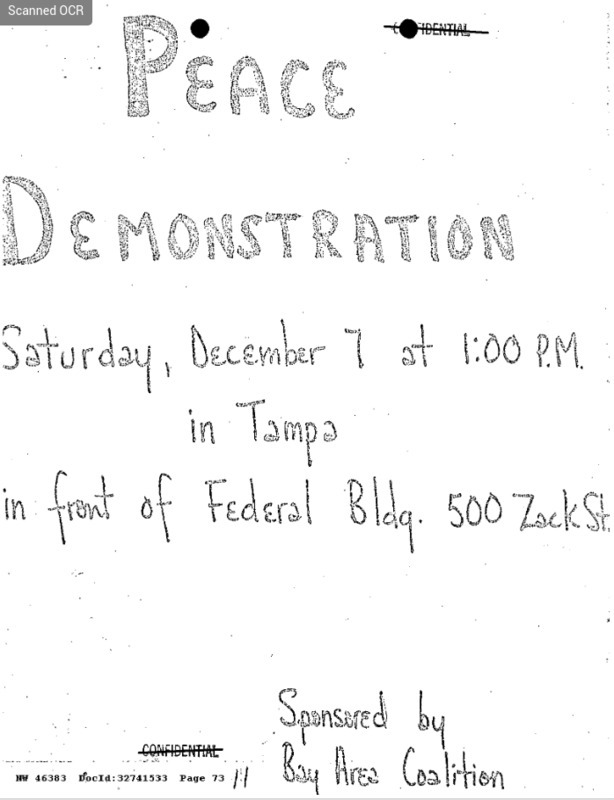 His intentions for this demonstration was to protest the war in Vietnam by leading other anti-war students to march in front of the Federal Building of downtown Tampa. The Coalition claims that activists from 8 other schools around Tampa would travel to partake in the demonstration, including University of South Florida, New College, St Petersburg Jr College, University of Tampa, and Florida Presbyterian. “This is to be a suit and tie affair,” spokesperson Mary Rutledge assured all interested parties, “we want to be taken seriously and won't allow any rabble-rousing.” The protest was to be one of serious demeanor, all wanted to share their opposition in the most respectful manner. During the decade of the 1960s, social dissent was sweeping across the nation as the Civil Rights and anti-War movements changed all aspects of society. Students often lead this change and faced scrutiny from a culture steeped in old mores. This scrutiny also came from institutions of authority, as the FBI used their powers to follow and keep tabs on dissenters and other subversive individuals. In the course of the surveillance by the FBI, Jeffries and twenty other individuals would be identified by name and through photography of the protest. 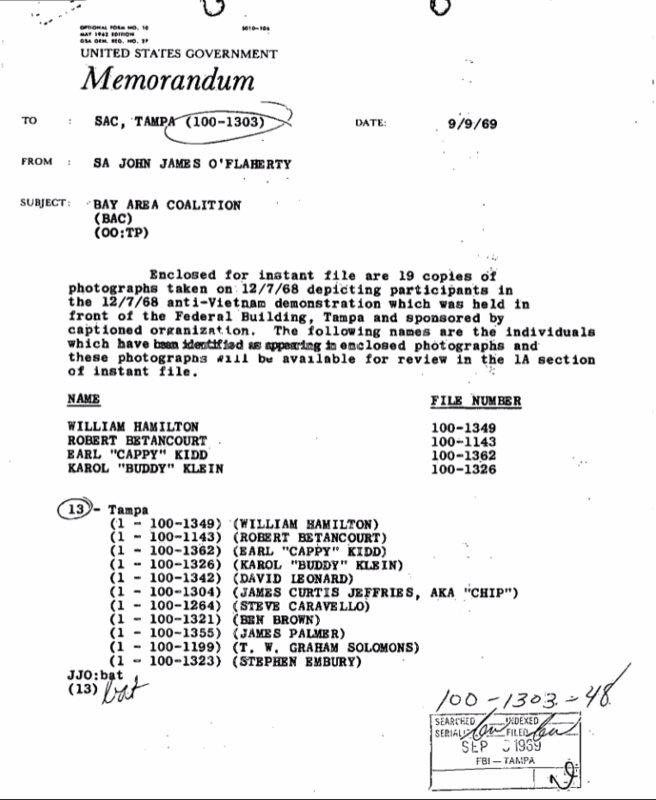 Their pictures are attached to the beginning of the Coalitions’ investigation file; ranged portraits, circled and labeled with names, suspects in an investigation for expressing their right to protest. This was no new phenomenon to those living in the 1960s. The FBI during this era became notorious for combatting any group which they deemed subversive to American values, which mostly included black Civil Rights leaders, New Left activists, academics, and anything they labeled as a political threat. The Bureau used their investigations and authority to silence dissent and worked to survey and weaken organizations working for social change. 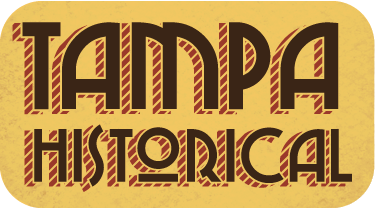 The federal investigation of the Bay Area Coalition’s demonstration here in Tampa gives us a real connection to this politically charged era, allowing us to begin to understand the reasons and motivations for each party. Demonstration pamphlet, 7 Dec, '68. Karol Klein, Ben Brown, and Earl Kidd. 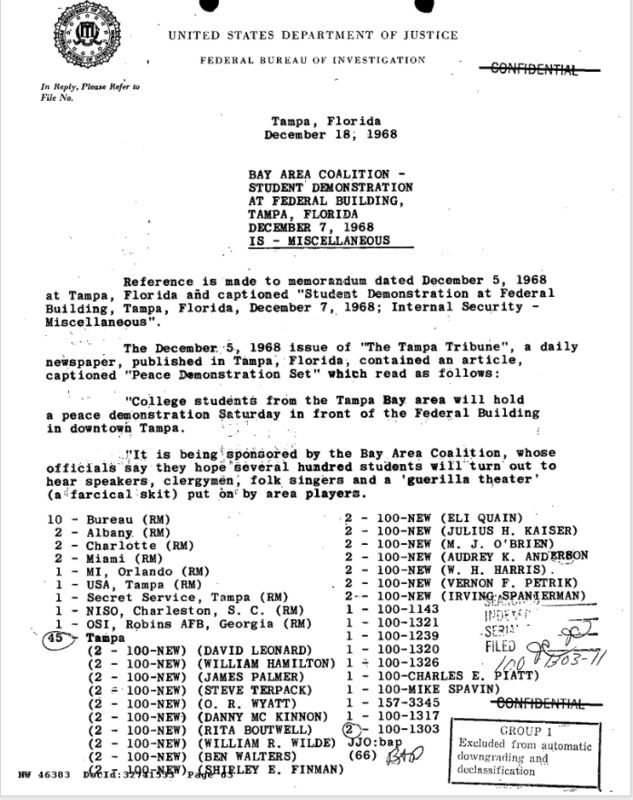 J. W. Rae, “Federal Investigation of the Bay Area Coalition,” Tampa Historical, accessed April 20, 2019, http://tampahistorical.org/items/show/47.